My husband loves pickles, and every summer I spend an afternoon sweating over a giant pot of bowling water making a half-dozen or so quarts of dill pickles for him. I don’t mind doing it. I actually rather like it. But, the thing is, I don’t much care for vinegar myself. And, so I don’t really dig pickles all that much. 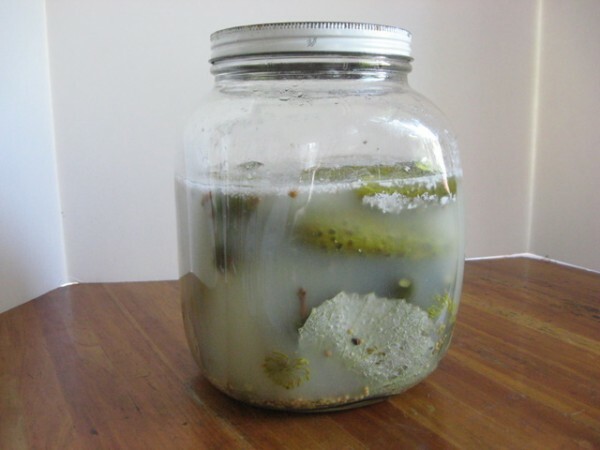 Recently, I ran across a blog post by Kim of Affairs of Living for Lacto-Fermented Vinegar-Free Pickles. Needless to say, I was intrigued. I made a half batch of her recipe, packed a jar with the ingredients, stuck a small bowl in the top to push the pickles down, and waited. Yah, that’s mold. Lots of nasty mold. Ye-uck. Nasty, icky, yuck. If you’ll notice in the first picture, a pickle escaped and floated to the top. I think that’s my main issue here. Pickle + air = nasty stuff. I haven’t given up yet. I’m going to try again – just a quart jar this time. VERY firmly packed. 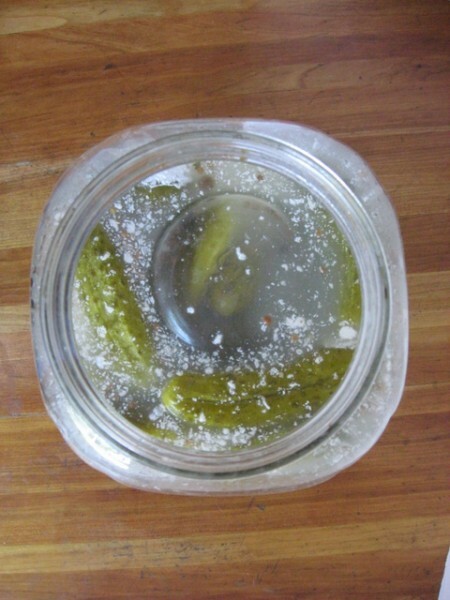 The Kitchen Stewardship blog has a good tip on using a small plastic lid that fits inside your jar to weight down the pickles. I think I’ll try that next time. What do you do when your experiments fail? Hmmm. . . well, I think baking fails are much easier to correct than pickling fails. The only home-pickled stuff I’ve made is cultured cabbage (sauerkraut), with a few other things thrown in. So far, it’s worked every time. Too bad about the pickles! I adore traditional dill pickles. Yah, the problem with pickling fails is that they can kill you. 🙂 I didn’t try to rescue these guys. I’ve never had a canning pickling fail, so I’ll definitely try again. Hitting the farmer’s market this morning to look for more cukes and dill. You are so brave! I confess mold makes me squeemish in every way so I am terrified of fermenting foods at home. I’ll wait and see how your successes go! Ugh! I hope the second time works better. I have attempted pickles once. They didn’t turn out well, there was no crunch. Which was disappointing. One day I will try again. I will watch your progress. ACK! I tried the same thing, with the same results – THREE TIMES. Finally figured (via a lacto-fermenting expert and friend) out that I needed to add extra salt. Maybe I’ll try that…next summer. I had enough moldy pickles for one season. Just was introduced to your site yesterday – love it! I actually had success with my second batch by making sure that all the cukes were under water and by only fermenting on the counter for about 24 hours before moving it to the fridge. The hubby liked them, but not better (really) than the water bath canned version. So, not sure if I’ll do them this way again. We still have 1 unopened jar, so I’m curious to see how long it will last.